I’m still trying to get over the fact that my Texas Rangers lost the World Series two in a row. But that didn’t stop the Rangers’ Josh Hamilton from earning the social media MVP award, based on positive-to-negative sentiment from fans in the USC Annenberg Social Sentiment Index that I mentioned in a couple of recent posts. 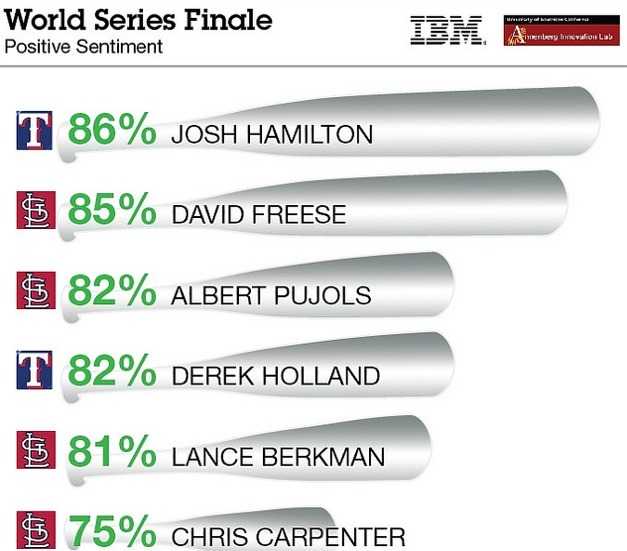 Texas Ranger Josh Hamilton just edged out St. Louis Cardinal David Freese for the "Twitter MVP" in the USC Annenberg Social Sentiment Index for this year's MLB World Series. 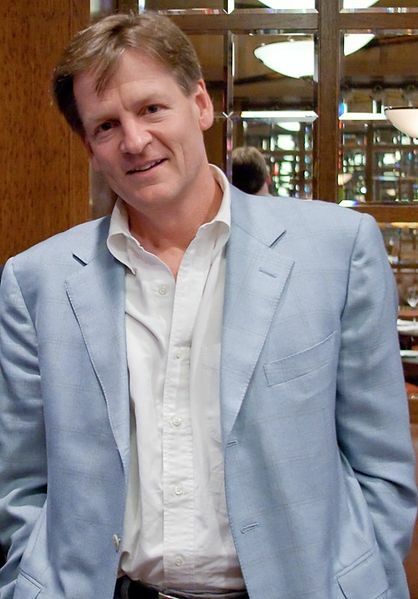 The final analysis from the 2011 World Series between the Texas Rangers and the St. Louis Cardinals revealed that Hamilton took home the MVP, but just edged out the Cardinals’ David Freese by 1 percent. Thank Heavens for small favors. Freese was the Rangers’ clutch hitting nemesis during those last two games. The USC Annenberg Social Sentiment Index is an ongoing project between IBM and the Annenberg Innovation Lab (AIL) students to explore Twitterology trends, the moods associated with social media communication. Students are using IBM Social Analytics technology to analyze millions of tweets in order to assess public social media engagement and opinion from sports and film to retail and fashion. Each game in the World Series averaged a million tweets, totaling seven million total tweets for the entire series as diehard fans exuded their social media voice and opinions on the players and coaches they followed. IBM and AIL analyzed each game, identifying the players and coaches with the highest tweet volume and most positive sentiment, then generated a final analysis for the series. Texas manager Ron Washington generated five times more tweets than his counterpart, St. Louis Cardinals’ managerial veteran Tony La Russa. Freese earned an 85% ‘T’ score – the ratio of positive to negative tweets; Albert Pujols earned an 82% positive sentiment rating. Texas’ Derek Holland pushed ahead of St. Louis’ Chris Carpenter. Holland garnered the most tweets for any pitcher during the series, and a respectable 82% sentiment score. While Carpenter, clearly a star and critical to the Game 7 victor, earned a 75% rating. Clutch player Lance Berkman from the St. Louis Cardinals earned an 81% sentiment score, putting him in close contention for social media MVP. Fans appreciated the game’s specialists, such as Arthur Rhodes from St. Louis, who appeared in three World Series games. He got one batter out in each game that he faced, helping him earn a fan high of 94% in Game 7. More social sentiment as discovered in the USC Annenberg World Series Social Sentiment index using IBM business analytics technology. The analysis found the volume of tweets associated with players and coaches had a strong correlation to the amount of television face time each received during the games – regardless of the caliber of player or coaching performance. What mattered was personality and fans’ affinity for it defined the social sentiment. With each additional game, fans couldn’t wait to turn on the TV and their Twitter accounts, generating a higher TV audience and higher volumes of tweets, igniting the power of fans’ banter, usually limited between themselves and their televisions and inserting it into a measurable voice in the Twitterverse. “This analysis underscores why the social media element in sports — and in any industry — should not be discounted as an unimportant source to glean actionable insights,” said Professor Jonathan Taplin, Director of USC Annenberg Innovation Lab. IBM and AIL are collaborating to help students explore how analytics technologies can be used by organizations from news outlets and journalists to movie studios and film marketers in order to understand information buried inside Big Data – structured and unstructured information. To date, the Index has been applied to film forecasting in order to accurately predict movie blockbuster success rates, and most recently was used by students to identify top trends for retailers from the New York Fashion Week shows. With this project, social analytics is proving you can find out how a fan is feeling directly from the fan’s mouth, or in this case, Twitter handle, versus relying on what traditional media is telling us the fans are feeling. The same principle applies in the business world too, social analytics is changing in the way research is conducted as the rise of social media has participants discussing openly what they like and dislike, what their plans are, and so on. For marketers, business analytics may take the place of traditional market research in the future as a growing number of companies start to use the technology to track market sentiment. In fact, according to IBM’s 2011 Global CMO Study of more than 1,700 chief marketing officers, the majority of the world’s top marketing executives admit they are not sufficiently plugged into real-time conversations about their brands. Eighty-percent or more of the CMOs surveyed still focus primarily on traditional sources of information such as market research and competitive benchmarking. Many identified their key challenge as the difficulty in analyzing vast quantities of data to extract meaningful insights that can improve products, services and the customer experience. However, eighty-two percent of CMOs say they plan to increase their use of social media over the next three to five years. IBM’s collaboration with the USC Annenberg Innovation Lab is part of its continued efforts to advance student skills in analytics across academia. IBM is working with more than 6,000 universities around the world to develop curricula and provide training, resources and support for business analytics. You can learn more about IBM business analytics capabilities here. Never mind the fact that I’m a Texas Rangers fan. Never mind that I grew up in north Texas playing the game of baseball, first as a pitcher, then later as an outfielder, a short stop, and finally a catcher. Never mind that baseball in north Texas was almost a religion, and that for young boys growing up on its plains there was nothing like those lights surrounding the diamond at night. Also, never mind the fact that for nearly 50 years, the Rangers could never seem to pull it all together at the same time — the hitting, the fielding, and the pitching. Never mind that I lived in and around New York City during the Yankees late 1990s heyday, even attending a World Series game against the Atlanta Braves, a nail biter in and of its own right. Put all that aside. Last night’s game between the Texas Rangers and the St. Louis Cardinals was simply epic. It was dramatic, it was heart-stopping, it was nerve-wracking…it was even heart-breaking at times. But it was also all what baseball in October should be about. Even though my team came out on the losing side, it’s a game I will never forget. And apparently, this series is one that the fans won’t forget anytime soon as well. 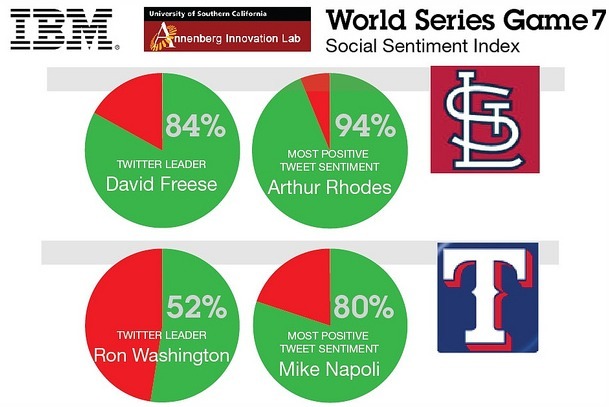 I mentioned in a post a week or so ago that IBM had partnered with the USC Annenberg Innovation Lab to mine social sentiment for this year’s World Series. In the last report, which covered games 3 and 4, the number of tweets increased from game 2 to game 3 as fans turned to Twitter to share the baseball experience. I expect the Tweets in game 6 will be off the charts. There are some other interesting highlights which you can read in the Smarter Planet blog post here. I tried to keep an eye on the Twitterstream last night, recognizing that game 6 was something special. But I wasn’t alone, as the Twitterstream moved by so quickly, it was difficult to even read the individual posts. I expect game 7 will be no different. I’ll be firmly planted on the edge of my couch for its entirety. I heard the news last night that rescuers were close to pulling the first of the Chilean miners out of the mine using the “Phoenix” capsule, but went to bed before the first miner had been lifted out of that deep hole. As of this morning, 12 of the 33 trapped miners have been rescued, and they’re reporting they’ll now be able to pull out a single man every 50 minutes (it was originally taking an hour). If I were one of those miners or their family, I think those ten minutes might add up quickly and I’d be happy for every shortcut I could get. Due credit to Chilean president Sebastian Pinera, who was a believer long before they had even confirmed whether or not the men had survived the mine collapse, and to all the parties involved in the rescue: Our own folks from NASA, the psychologists on the surface caring for the men during their traumatically long stay, the American experts drilling the holes, and of course, all the families who stood vigil waiting for their loved ones. Two months they were down there, people. 70 days, to be precise. Think about that the next time somebody cuts you off on the freeway or takes the last loaf of bread at the grocery store. Speaking of the last loaf of bread, I can’t refrain from also commenting on my Texas Rangers who, for the first time in franchise history, won an American League division playoff last evening against the Tampa Bay Rays and are headed to meet the New York Yankees in the American League Championship Series starting this Friday. That’s fifty years of Texas baseball with nary a division breakout and trip to the ALCS. Cliff Lee’s pitching performance was a big contributor to the road to the show: He won Texas game one, and then threw a six-hitter last night: 90 strikes in 120 pitches. And, of course, Texas had some sharpshooter base running for the early scoring. So now, of course, I have a personal moral dilemma. Any other year I’d be rooting for the Yankees in the post-season playoffs, but with Texas’ chance to finally head to a World Series, I have to root for the Rangers (just as I did for the Astros several years ago when they finally made their first showing in the world championship). 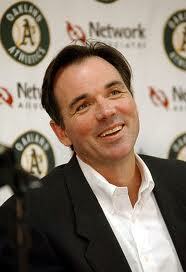 The way I see it, I can’t lose: One of my two favorite baseball teams is going to the World Series this year. And the entire world wins as the Chilean miners continue to make the trip out of that long, dark hole in the Phoenix. “The Chilean moon landing,” Kerry Sanders called it on MSNBC reporting live from the scene. Amen, brother. The Phoenix has landed.